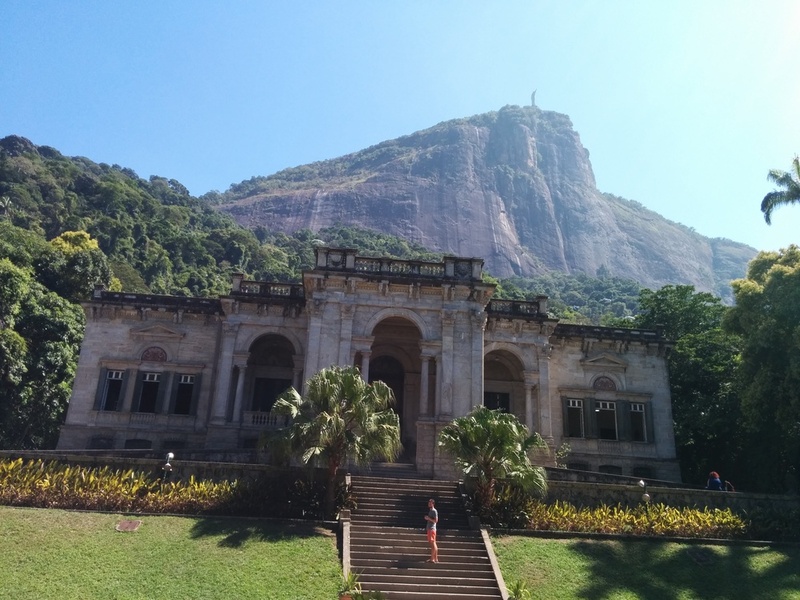 Having gone to Cristo Redentor on Wednesday, Thursday's plan was to go to Rio's other super famous site - Sugar loaf mountain (Pao de Acucar.) I am a bit embarassed to admit I had never heard of it before getting to Rio. So if you are reading this and wondering what the hell sugar loaf mountain is, you are not alone. It is a mountain in Rio that looks like a loaf of bread and from whose peak you can get stunning views of the city. My friend and his girlfriend got back into Rio from Sao Paolo early in the morning, and in the early afternoon we went off to run errands. The previous day I had tried to use my US debit card at an ATM only to realize I had forgotten my pin (I never use this card in Kenya). I had a few hours of panic when I was emailing the bank to find out if there was a fast way to get a new pin (which of course there wasn't), only to remember my pin in the middle of the night. I tried out my card at the ATM before heading off to Sugar loaf and I was thoroughly relieved to find out that the pin I remembered, was indeed the right one. Phewks! The drama that you don't want when traveling ....running out of cash and/or not being able to get your cash. I still remember a few years back when I went to either Ghana or Nigeria, and my CFC stanbic card wouldn't work. Such drama! You can easily become the person on the street with a signboard "Please assist me. I came here from Kenya and need some money to get back home or contact my family." There was also another time when I almost had to be sent cash via Western Union to Sicily, but that is another story for another time......and in all honesty, that was when I was young and dumb. I went there with barely enough money and obviously everything ended up costing much more than I had budgeted - as it usually does when traveling. After breakfast we went off to discover this magical "asayi" smoothie my friend kept on referring to. He had said you could get it in any juice place, but I had repeatedly looked for signs reading "asayi" and had found none. Finally we got to the place and he pointed it out on the menu, and I said "Oh! Acai!" Who would have known that it was not actually pronounced as a-ka-i. Wonders never cease. We finally got to Sugar loaf mountain. We hopped into the cable car, and I suddenly remembered I have a terrible fear of heights (I know.....how does one usually forget that, until you are about to go up somewhere really really high, and in a cable car for that matter.) We got to the first peak, got off, and the view was just breathtaking. From one side you could see the ocean and all the beautiful boats. You could also see most of the city. From the other side you could see Cristo Redentor atop Mt. Corcovado, and also see a bunch of other hills. In the distance you could see the favelas. It struck me as quite strange that favelas are on the mountainside. That is really prime property and there is no other place where I have seen slums on prime property. It is sad but poor people are generally relegated to the dodgiest parts of towns - swampy areas, uncultivable land etc. I really hoped to go to the favelas before leaving Rio, but time ran out. My first introduction to Rio favelas was from the movie "City of God." Brilliant movie that really highlighted the tough lives of the have-nots in Rio. We got back into the cable car and went to the second peak of sugar loaf. My friend told me there was an old James Bond movie where there was a stunt at this venue involving jumping off the cable cars. There were even more magical views from this second peak. After Sugar Loaf, we decided to go to Ipanema beach for the rest of the day. This is where you get to see the most amazing Rio sunset. I really wanted to buy some shorts and kept on wondering when we would come across some hawkers. Rio is really really expensive, so I was not about to attempt to buy them in a shop. Within the first 24 hours of being in Rio, I realized why everyone wears so little here. It is crazy crazy hot. It can get up to 40 degrees celcius on some days and the humidity is even more than in Mombasa. I realized that my jeans would not be worn again (until maybe I am in Bolivia, Chile or Argentina) and I needed some shorts. The prices didn't really budge. After 10 minutes I finally bought them. When my friend's girlfriend saw them, she loved them. We went back for her to buy a pair. Within 2 minutes she had gotten them at a price 25% lower than mine. This led me to my conclusion. Wherever you are in the world, you will always get screwed over on prices if you are 1. A foreigner and 2. Unable to speak the languge. It is a universal rule. The beaches in Rio are amazing. You can come straight from work and get sorted. Hawkers selling bikinis, people renting out umbrellas and chairs. People selling kangas. Beers and caipirinhas brought directly to you. You can literally go to the beach, stay there all day, do not lift a finger and you will be well fed, refreshed and liquored up. It is very addictive. We staggered home around 1am singing loudly in the streets. On getting home, the elevator was not working. Those were the longest six flights of stairs I have ever gone up.